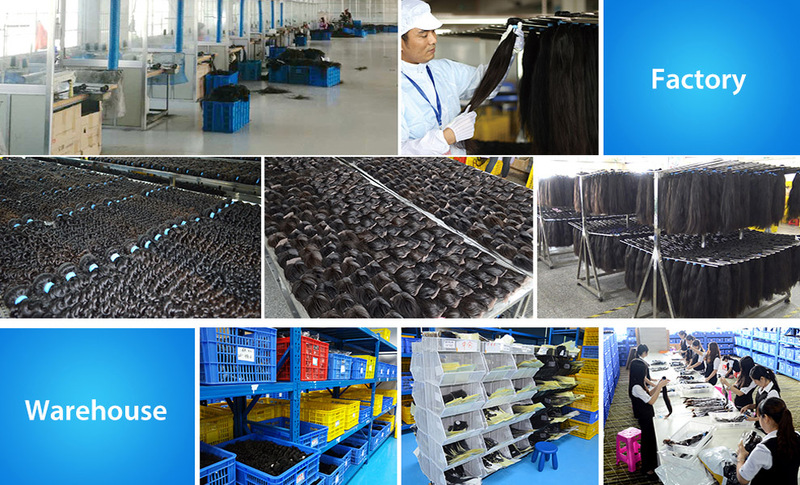 Kabeilu(KBL), a professional human hair supplier specialized in high quality virgin human hair products for nearly 11 yeas. By providing with high quality products and excellent service，KBL is always dedicated to creating real customers values for those who are in need of a full,long and beautiful hair to gain a long-lasting beauty, confidence or even a happy life. We love beauty, and beauty from KBL! 100% Natural Material: We cut one bundle hair only from one donor, then water clean and sew hair material into weaves. No chemical lotions to soften hair cuticles, you can totally feel the hair cuticles when running with your fingers. No harmless to your own hair or scalp, no broke,looks like growing a real head of long human hair. One Direction: All hair we collected are in a same cuticles with their own softness and shiny. Not easy to get broken and tangled, long-lasting glossy, durable and attractive. Consistency: All hair are in the same and consistency on thickness and length. Completely thick and well-proportioned, no any mixed low quality human hair or animal hair.Neat,tidy and full ends. Homogeneity​: The whole bundle comes only from one donor, so its color is very close to one color,but not same in all. In fact,the same color are chemical processed by hair dyeing. The whole bundle is harmonious to the skin, natural and good-looking. Hair Dyeing: Only 100% Unprocessed Virgin Human hair can be dyed and bleached into any colors evenly with no mixed colors or dark strands. KBL hair quality can be dyed or bleached into this result, particulary 613# color evenly(the most difficult bleach color is 613#). After several times dyeing, KBL hair still keep its bouncy and gloss, no nappy and frizzy hair. Hair Perming: True virgin hair without process can keep hair waves very well for a long time, and hard to loose its shape. KBL hair can hold curls well, and can be changed into any styles by straighteners or curls. And the hair will restate its original waves after wash.
2 Years Life-span: 100% real virgin human hair, you can at least use 2 years under good care, durable and reusable. Hardly Hair Shedding: Except for the machine work to sew the weft head tightly, the consistency of hair material will helpful to avoid shedding. Hardly Hair Broke: Unlike some black women's own hair, hair will get loss and broke. KBL ture virgin hair is firm and has good tenacity, which is not easy to broke. Just pick one strand hair to test. Hardly Hair Tangling: All hair cuticles are in a same direction, whole and intact, no disorder between hair roots and ends, smooth and original.